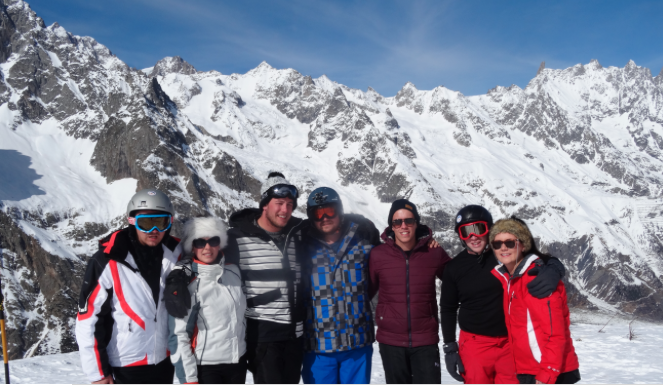 After an excellent performance in November, December and January, the team at Conspicuous jetted off for a well-earned break on the ski slopes of Courmayeur, northern Italy. Recruitment can be a difficult game, but the team at Conspicuous worked extremely hard from November through to January. As a result, company Director Rob Wachman decided it was time for a treat. The team embarked on their trip on Thursday evening, saying goodbye to the office and hello to the prospect of an action-packed, snowy and sunny weekend away. With wooly hats and gloves packed, the team arrived in Courmayeur ready to hit the slopes hard, and hit them they did. Some members of the team didn’t have a lot of previous skiing experience before this excursion, but by the end, most were tackling the black runs and attempting jumps in the snow park. It wasn’t all about the action though, and the team found time to soak up the sunshine, eat plenty of great Italian food, and unwind in the bars and nightclubs of Courmayeur. He continued, “without a massive team effort, Conspicuous wouldn’t have been able to beat their targets – or go on this thrilling, fantastic weekend away. It’s a real testament to everybody who works at Conspicuous that they’ve managed to excel themselves once more”. This wasn’t the first time the company has gone on holiday, though. Last year, in fact, the company went to Flaine, in France – more skiing. At this rate, the more experienced members of the team will be qualified instructors in a couple of years. Here’s to an excellent teamwork performance, an excellent skiing trip, and another excellent year ahead.